“Why don’t you give us more vegetarian recipes?” is one of the most common questions from 50 Campfires curious culinary crowd. Our answer is, “We do!” But we have to admit that they get spread out in the magazine and on the website, mixed by theme with recipes that include meat, fish, and poultry – and their byproducts. So, to make things more convenient, we offer this compilation of some of our favorite recent vegetarian recipe posts for breakfasts, salads, snacks, main dishes, and deserts. 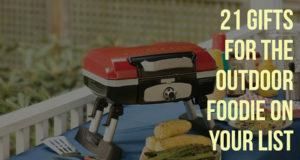 If you’re in the mood to share, send us your favorite vegetarian camping recipes. We’ll cook them up, take photos, and post them up to the website – with full credit of course! 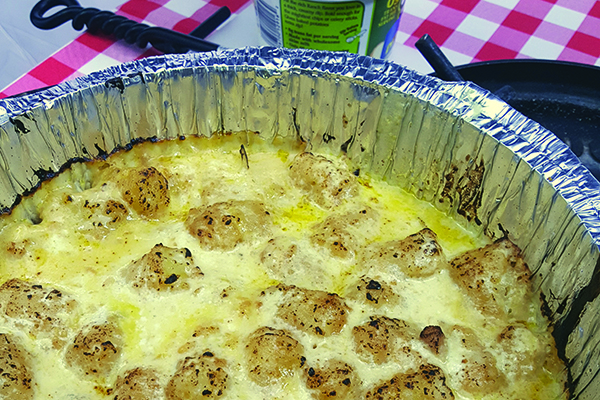 Tater Tot® Hot Dish is the official Minnesota state casserole, but you don’t have to be camping in the Land of 10,000 Lakes to enjoy this one. 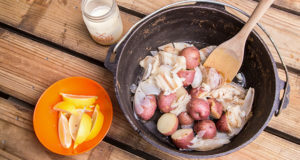 It’s campfire ready, and has the zesty boost of Dean’s French Onion Dip. Make this recipe! 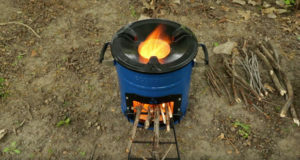 Heat a 12-inch covered Dutch oven by placing it on top of 10 gray charcoal briquettes. In a large mixing bowl, combine Tater Tots®, soup, and Dean’s French Onion Dip. Once Dutch oven is hot, remove lid and spray inside with cooking oil spray. Add chopped onions and cook for two minutes, stirring until translucent, but not starting to brown. Pour mixture into Dutch oven, and sprinkle the top evenly with grated cheddar cheese. Replace lid, and evenly distribute 14 gray charcoal briquettes on top. Cook for about 45 minutes until tots are brown and crisp on top. Begin checking for doneness at about 30 minutes. 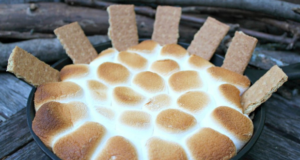 What’s not to love about this vegetarian campfire recipe? 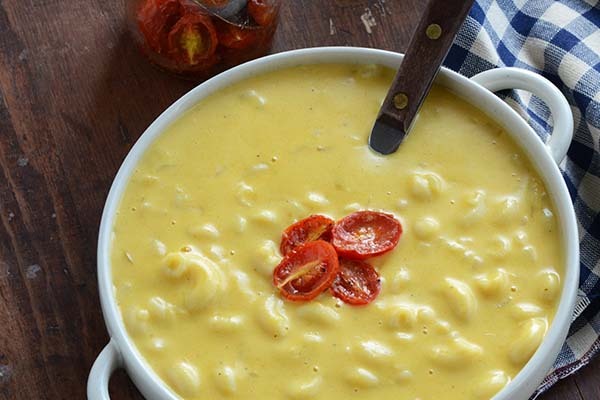 Everyone’s a fan of mac and cheese … including the kiddies. And on top of it all, the roasted cherry tomatoes add just the right savory zing for the adult palate. You better make a double batch because this one won’t last long when your campmates catch wind of it. Roast the cherry tomatoes at home before the trip and bring them along in a zip lock back with just a little olive oil – or sub in reconstituted sun-dried tomatoes if you wish. Preheat oven to 425F. Place the tomatoes, cut side up, on backing sheet. Drizzle with the olive oil and sprinkle with salt and pepper. In 10- or 12-inch Dutch oven, melt the butter over medium heat. Add the garlic and cook, stirring constantly for one minute. Whisk in flour, then slowly whisk in the vegetable broth and add the bay leaf. Increase to high heat and bring the broth to a boil. Add the macaroni and boil until al dente … about 8 minutes. Remove bay leaf. Stir in cream, mustard, Worcestershire sauce, Tabasco sauce, and pepper. Slowly bring the soup to a boil again for two minutes, stirring occasionally, then remove it from the heat. Ladle the soup into serving bowls and top with the roasted tomatoes. 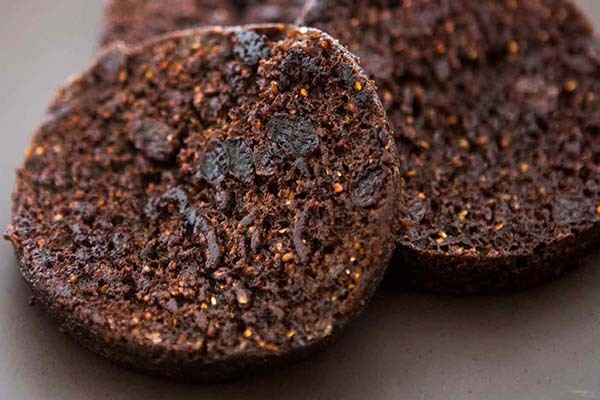 You’ll need a food dehydrator for this recipe. Cook time can be greatly influenced by the climate you are in. For example, in Florida during summer season the time will be three to four times greater than needed in a northern, drier climate. 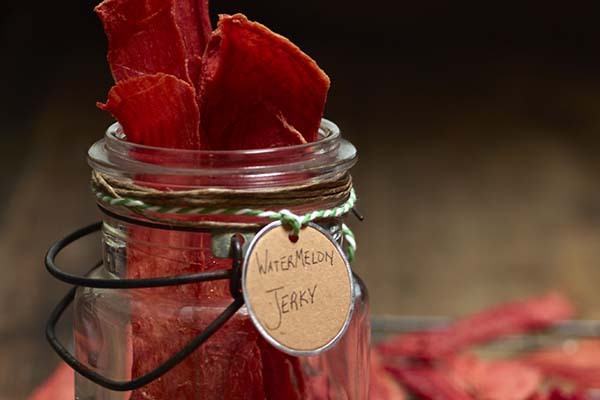 Fair amount of watermelon cut into 6"-8" strips about ½" thick (think Hershey bar or men's belt). Wherever you go in Colorado you’ll see Chile Verde or Green Chile offered as a side dish or sauce. It goes well as either. For the campsite we cut some corners, but this is still a dish that needs some simmer time to turn out really delicious. 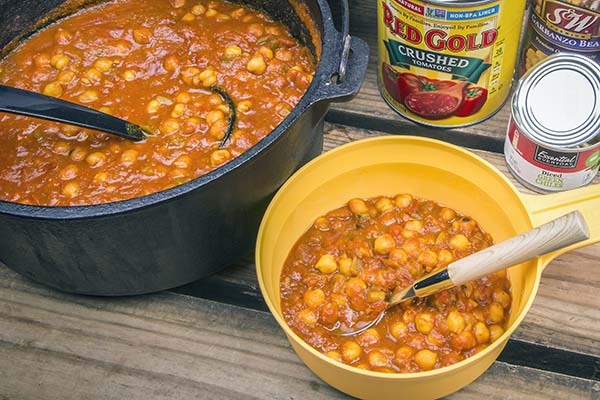 You always have the option of making a batch ahead of time and bringing it to camp to reheat. It even freezes very well. Here’s the deal, though. If you plan to make it ahead, do it when you can be alone in the kitchen. 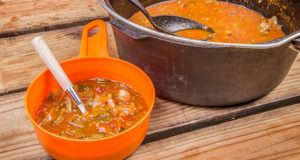 The smell of the roasting peppers will gather a crowd who will eat the chili and leave you without any to take to camp. Oh … and one more thing. 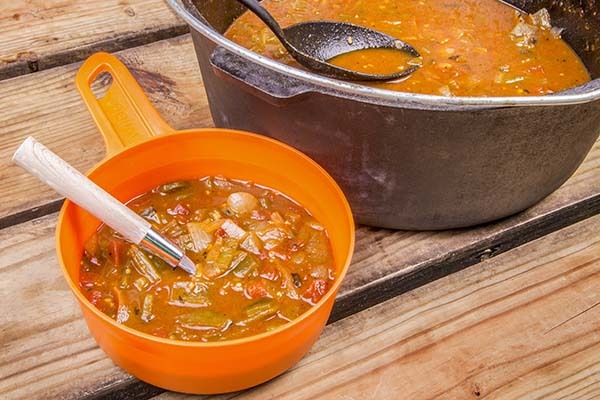 Authentic Colorado Green Chile is made with Hatch Peppers from New Mexico. The only kind of Hatch Peppers we can get “back East” are canned and you can’t do a good job of roasting anything but fresh peppers. So we substituted a combination of Poblano, Anaheim, and jalapeno. It came out really well. Roast all peppers over campfire or gas flame until skins are blacken and blistered. Chop onions and gather the rest of your ingredients. 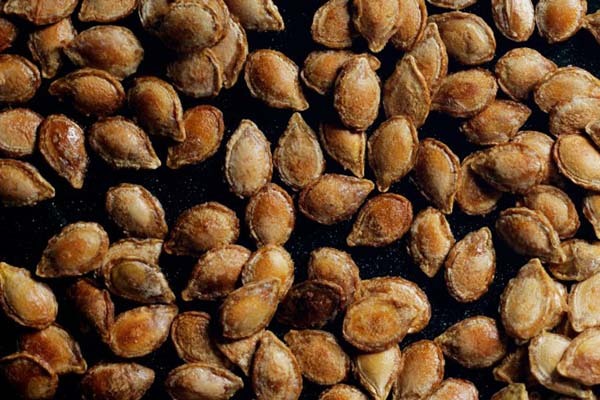 Once peppers are cool enough to handle, use your hands to remove charred skin and the seeds inside. Then roughly chop the peppers. Heat olive oil in a 12-inch cast iron Dutch oven. Add chopped onions. Fry for about 3 minutes, stirring often. Add minced garlic. Stir constantly for 2 minutes. Stir in diced tomatoes (undrained) and chopped peppers. Sprinkle in flour and stir. Add broth, cinnamon, chili powder and salt. Bring to boil, then lower heat and simmer uncovered for at least 30 minutes. Longer is better. You’re looking for the chili to thicken a bit. 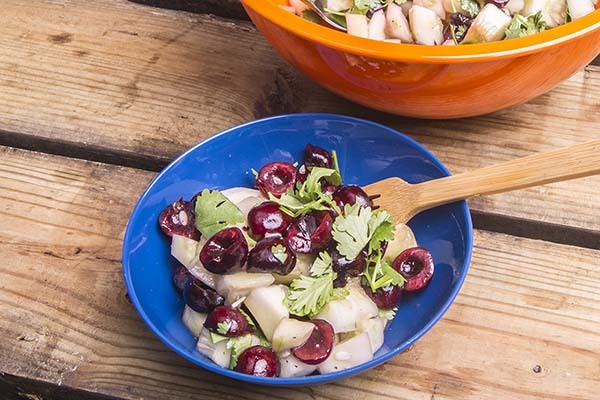 This is a light, quick salad that makes the most of the late-July to mid-August harvest of sweet cherries in Door County, Wisconsin. You can cut things up ahead of time and just keep them in the cooler to toss together when you’re ready or make the whole thing up in camp. Once mixed, it will keep well in the cooler for about four hours. In large bowl, toss together cucumber chunks, vinegar, oil, salt, and pepper. Add cherries and cilantro leaves and toss lightly. 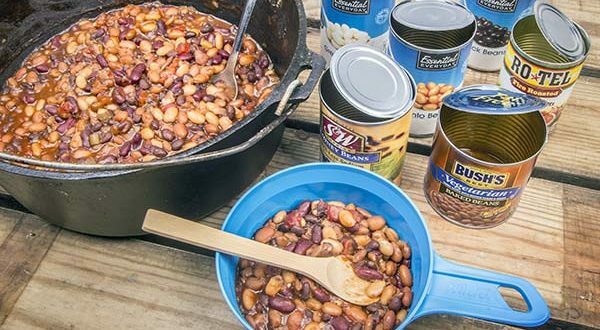 This is a great “sit and simmer dish.” Put it together at lunchtime or before, and let it sit on the edge of the campfire coals. The longer it simmers, the more the flavors come together and build. This recipe is wide open for interpretation with your favorites. Mix whatever kind of beans you’d like. And it certainly doesn’t have to be vegetarian if you don’t want – start with some browned sausage or burger to turn it from a side dish into a main course. Or start out with bacon grease to fry the onions and garlic. Heat oil in 10- or 12-inch cast iron Dutch oven. Stir in chopped onions and cook until they become translucent. Add minced garlic and cook for another minute, stirring constantly. 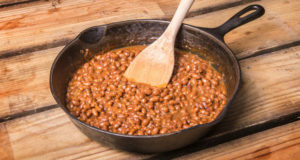 Open all the beans and drain off liquid (except baked beans). Refill the cans with fresh water, then pour it off the beans. This rinses the beans to help reduce their gastronomic effects. Add the beans (including the baked beans with sauce) to the onions and garlic. Add the can of diced tomatoes with the juice. Add the BBQ sauce and hot sauce to taste. 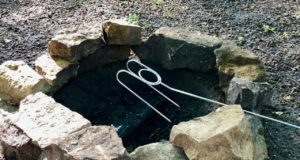 Cover Dutch oven and place in the coals at the edge of the campfire. Allow to simmer for at least several hours; add water as necessary to keep from burning. Stir occasionally, but not too often so as not to break down the beans. They’re best if they’re still a little el dente when eaten. Curry lovers listen up! This is a good, fast one. It’s also another vegetarian dish that will satisfy any hungry camper as a side dish or on its own served over rice or couscous. In 10-inch or 12-inch Dutch oven, heat oil. Add onion, ginger, and half of curry powder. Cook, stirring frequently, until onions are soft and translucent. Add tomatoes and green peppers with juice and stir well. Add remaining curry powder and salt. Bring to boil, then turn down heat to simmer for about 10 minutes. Add drained chickpeas and return to simmer for another 15-20 minutes. Adjust seasoning to your liking with more salt, black pepper, hot sauce and/or crushed red pepper flakes. You can make brown bread pretty easily yourself and, oddly enough, you make it in a can, too! The biggest things that set brown bread apart from “regular” bread are it has no yeast and it is steamed instead of baked in an oven. 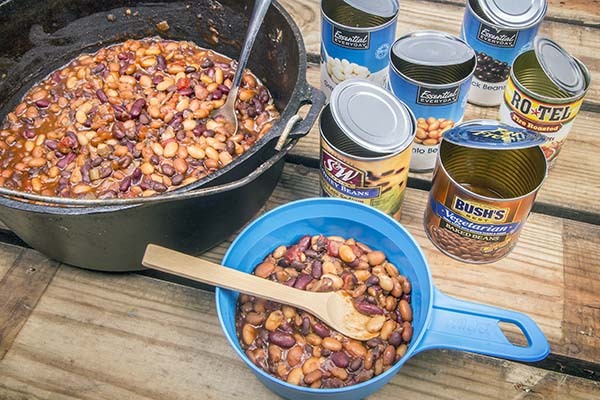 Here’s a recipe to try with your Dutch Oven right at your campfire. This is a fun "bread making" project for the whole family at the campsite. The kids will get a kick out of making bread in a can. In large mixing bowl, mix together all dry ingredients. Add wet ingredients (and raisins, if you're using), and stir into a smooth batter. Thoroughly butter the inside of the coffee can. Spoon the batter into the can, leaving at least 1½ inches at the top to allow for the bread to rise. Cover the can securely with greased aluminum foil. 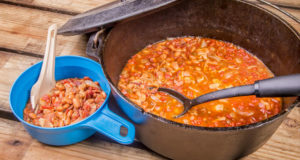 Place the can in a Dutch Oven deep enough that the lid fits tightly with the can upright inside. Add enough water to come halfway up the can. 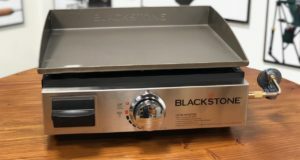 Bring the water to a simmer, then cover the Dutch Oven, and steam for 90 to 105 minutes, until a toothpick inserted in the top of the bread comes out clean (remove foil to test.) 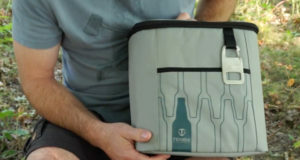 Replenish the water if needed while steaming. Cool bread in the can on a baking rack for at least 10 minutes, then remove from the can. If the bread won't come out from the top, use a can opener to remove the other end of the can and push the "loaf" on through. Slice and serve with butter, and honey if you like. 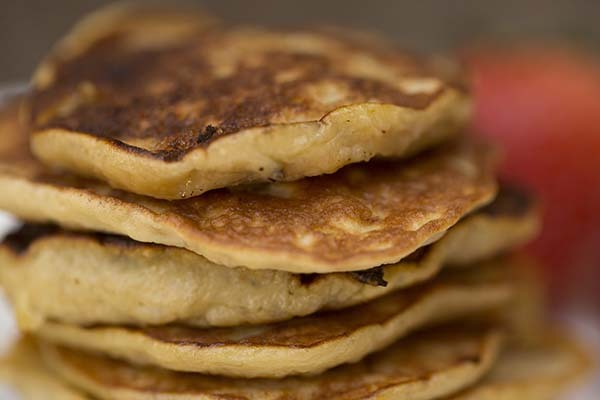 These banana pancakes can be made with just two ingredients – bananas and eggs – or you can up the game with some vanilla if you like. They are delicious as is or with butter, maple syrup, blueberries, and/or Nutella on top. Dig in! In a bowl, mix together bananas and eggs at a 1-to-1 ratio (one egg for every banana). Mash this up and mix until no lumps remain. A potato masher works great for this. Add ½ tsp. vanilla extract per banana (if using). Heat greased skillet or griddle over medium heat. Pour out “batter” to the size you want our pancake. Cook for about one minute until bubbles appear. 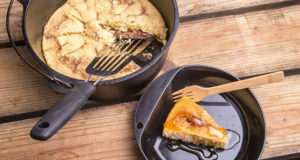 Flip pancake and cook until golden brown – about a minute more. Next: The 50 Campfires WORKSHARP Guided Field Sharpener GIVEAWAY!